The Larson family presents the Torah to Dr. M.G. “Pat” Robertson. Photo courtesy of Elisa Sosa. When Ken and Barbara Larson learned that few Hebrew professors have ever read from an actual Torah, they knew they had stumbled upon their distinct mission. 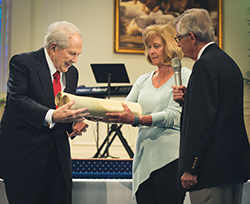 On Wednesday, March 16, the Larson family continued their mission to provide institutions around the country with these sacred texts, as they presented Regent University with an 18th century Torah scroll. B. Larson said her deep love for Israel and the Jewish faith was “seeded” for her at an early age, after reading famous texts, like The Diary of Anne Frank. Now, as the couple celebrates more than 50 years of marriage, 19 grandchildren and 10 trips to Israel, she believes that those seeds are coming to fruition. Rosalin Mandelberg, Senior Rabbi of Ohef Sholom Temple and president of the Board of Rabbis and Cantors of Hampton Roads, reflected on the power of the Torah – explaining that it is the Jewish people’s “most cherished treasure,” which they carried during times of great rejoicing and suffering. Dr. Scott Carroll, ancient history scholar, who has worked with an estimated 10,000 Torah scrolls through the span of his career, spoke on the scroll’s unique history. “Every Torah has its own DNA; it’s unique and describes the community from which it belongs,” said Carroll. The Torah given to Regent originated in the nation of Yemen in 1750. Through the years it’s remained preserved, even surviving the nation’s exodus of some 49,000 Yemenite Jews during “Operation Magic Carpet” in 1949. Learn more about Regent University’s School of Divinity and Regent’s Campus Ministries.